« Biblical or Secular Images? This page highlights several of the Irish High Crosses that have scenes that have Classical or “Pagan” content. 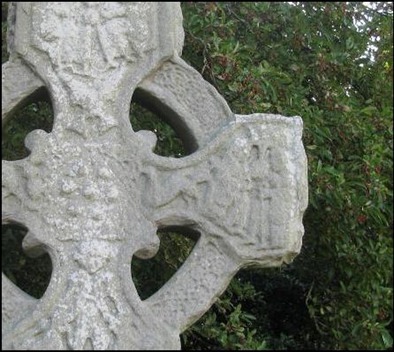 Classical images appear rarely on the Irish High Crosses. Here we take a look at two of these rare images, the centaur and the griffin. The centaur is an ancient symbol that combines a man and a horse. 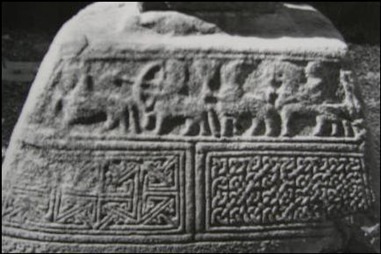 We will take a look at the use of centaurs on the Cross of Muiredach at Monasterboice and the Market Cross at Kells. The Griffin is a combination of an eagle (head) and a lion (body). 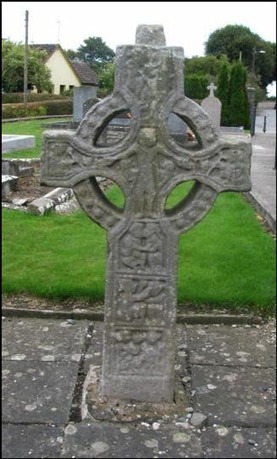 We’ll look at the use of griffins on the South Cross at Kells, the Scripture Cross at Clonmacnois and the North Cross at Duleek, pictured to the left. Helen Roe informs us that classical creatures, like the centaur, made their way “into Christian illustration when various moralizing connotations were attached to them.” (1988, p. 40) So what are the moralizing meanings attached to the centaur? George Ferguson, in Signs and Symbols in Christian Art describes the centaur as a symbol of savage passions, the human divided against itself and the heretic. So, in general, the centaur has a negative connotation connected with sin or enmity toward the Christian faith. 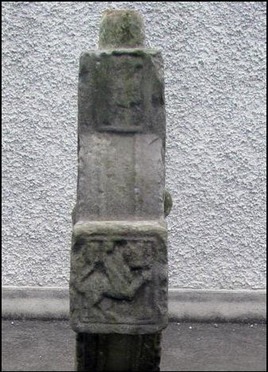 On the base of the Market Cross at Kells [left] we have two more centaurs. The one to the right holds a bow and arrow. 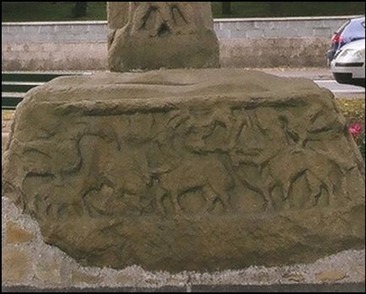 The one in the center of the scene holds a trident. This figure also seems to have more of a goats head than a human head to me. Could it be intended to represent the devil? If Roe’s interpretation is correct, it adds some credence to the identification of the centaurs as representing opposition to Christ and to the Christian faith. As we saw with the centaur, the griffin is undoubtedly used on the Irish High Crosses with an eye to its moral meaning. Interestingly, in Christian Art this creature has been used both to represent the devil and Jesus Christ. As an eagle and a lion the griffin can represent strength and wisdom. 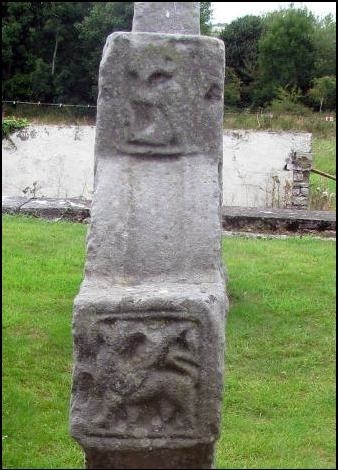 Kells: A single griffin can be found on the Cross of Patrick and Columba at Kells, pictured to the left. It seems to be completely without context. The griffin is turned away from the image on the north arm to its right. This image depicts Saint Paul the Hermit and Saint Anthony meeting in the desert. In this famous story, a raven brings bread for the two of them to share. However, there is an interesting story told of Paul the Hermit on his way to find Anthony of the Desert. In this story a centaur meets Paul and directs him to Anthony. (Ferguson p 14) Is it possible that the griffin here is a reference to that same story and is moving away, having directed Paul to Anthony? This opens an interesting possibility. We may have the symbols of all four of the evangelists. The only thing needed is to transform the angel with a book to a man with a book and you have the symbol of Saint Matthew. This is certainly possible since in the Book of Kells (folio 129v) the symbols for each of the evangelists have wings. 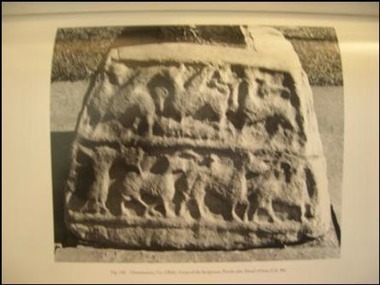 (Meehan p 41) Then, on the south arm and top we would have the ox of Saint Luke and the eagle of Saint John. On the North arm and top we would have the lion of Saint Mark and the human figure of Saint Matthew. Another simpler solution would be to focus on just the ends of the two arms. If we identify the image on the north arm as a griffin (and it certainly could be in my mind) we then have two griffins and no relationship between the images on the ends of the arms and the images on the top of the cross (north and south). Ferguson, George, Signs and Symbols in Christian Art , Oxford University Press, 1961. Meehan, Bernard, The Book of Kells, Thames and Hudson, 2002. Roe, Helen M., The High Crosses of Kells, Meath Archaeological and Historical Society, 1988.